One year ago, Nisha had never used a computer before. Today, she works full-time as a radiology technician in a major hospital in Mumbai. Growing up in small town two hours outside of Mumbai, India, Nisha knew only one way out of village: marriage. It was the common path into adulthood for all of the young women in her village. But all her life, Nisha wanted more. So last year, she did something about it. Availability of skilled resources is one of the biggest impediments to growth and penetration of quality healthcare across India, especially in remote areas of the country. It is estimated that India requires nearly 6.5 million health professionals but currently has less than 300,000. According to India’s National Skill Development Corporation, by 2018 the healthcare technician demand-supply gap in India will be 445,000, an 84% shortfall. 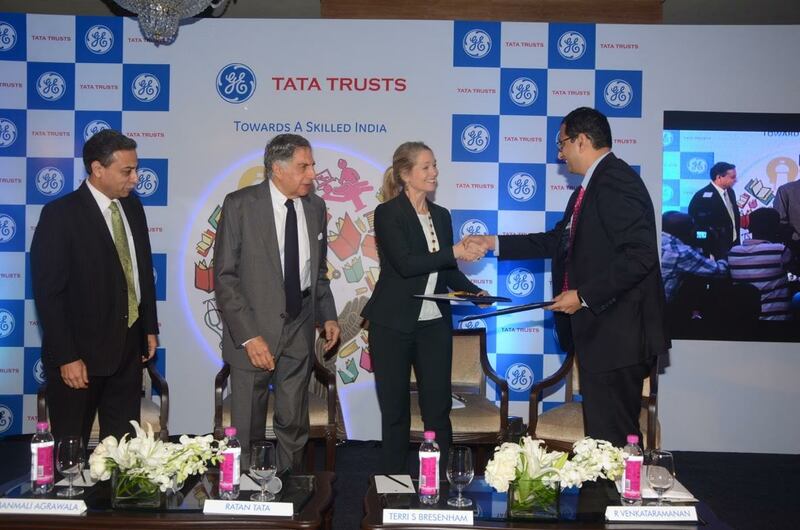 It’s why Tata Trusts and GE Healthcare, two leading companies in India and the world, this week announced a partnership to train 10,000 youth in various technical areas of healthcare over a three-year period . The partnership will focus on bridging the skills gap in healthcare technical or operating staff. Alongside many of the 150 other students from India who qualified for the x-ray training program, Nisha traveled two hours each way, five days a week to attend courses and internships. “The future of healthcare in this country is not just the doctors and the researchers. It’s dependent on students,” said Bharat Chaudhari, Senior Associate, Training and Development, at the GE Healthcare Institute in Mumbai, India, one of ten sites across the country. Like many students he works with, Nisha was initially very quiet but overtime began to demonstrate remarkable confidence in her work. Globally, GE Healthcare has committed USD 1 billion in healthcare education over the next four years to train more than 2 million professionals in the healthcare technology space. In India, the GE Healthcare Education Institute runs its healthcare skill building and skill enhancement program – “Yogya Bharat for an Aarogya Bharat” which aims to improve access to quality healthcare throughout the country by developing skilled healthcare resources. With her efforts, Nisha is crossing more barriers than just the borders of her family and hometown. Of the global healthcare workforce, women represent only 30% of the top jobs. For an industry striving to tackle critical global issues like maternal and infant care, which so heavily impact women, many experts cite a need to ensure women are appropriately represented among those doing this work. The fact is that Nisha’s story is just one of many – all of the female candidates who enrolled in the early program last year are employed as full time radiology technicians. Now, with Tata and GE Healthcare’s commitment, at least 10,000 more are to follow, with a goal to ensure 50% of those candidates are female. One year ago, Nisha had never used a computer before. Today, she works full-time as a radiology technician in a major hospital in Mumbai, alongside some of the most advanced medical technology, and pays for her two younger sisters’ schooling. “She has gone a long way and she has much more to come,” neighbors now say to her parents.